James Bond adventure in the court of Queen Elizabeth! 1593: The dreaded alchemist, magician, and spy Dr. John Dee is missing. . . . Terror sweeps through the court of Queen Elizabeth, for in Dee's possession is an obsidian mirror, an object of great power which, legend says, could set the world afire. And so the call goes out to celebrated swordsman, adventurer, and rake Will Swyfte -- find Dee and his looking glass and return them to London before disaster strikes. But when Will discovers the mirror might solve the mystery that has haunted him for years -- the fate of his lost love, Jenny -- the stakes become acutely personal. With London under siege by supernatural powers, time is running out. 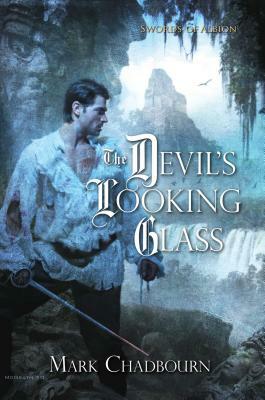 Will is left with no choice but to pursue the alchemist to the devil-haunted lands of the New World -- in the very shadow of the terrifying fortress home of the Unseelie Court. Surrounded by an army of unearthly fiends, with only his sword and a few brave friends at his back, the realm's greatest spy must be prepared to make the ultimate sacrifice -- or see all he loves destroyed. A two-time winner of the British Fantasy Award, Mark Chadbourn is the critically-acclaimed author of eleven novels and one non-fiction book. A former journalist, he is now a screenwriter for BBC television drama. His other jobs have included running an independent record company, managing rock bands, working on a production line, and as an engineer's 'mate'. He lives in a forest in the English Midlands. Visit Mark Chadbourn's Web site at www.markchadbourn.net. "Two-time British Fantasy Award winner Chadbourn offers a grim and decidedly current take on supernatural Elizabethan intrigues. Will Swyfte, England's greatest spy, is charged with stopping the faerie and their Spanish tools from acquiring the Skull, the Key and the Shield, magic items whose combination could devastate all of Britain. . . . Readers familiar with Cold War spy novels will wryly note Swyfte's visits to Dr. John Dee for the latest in spy technology, à la James Bond and Q. Graphic presentations of tortures from the rack to waterboarding recall contemporary issues in national security, carefully contextualized with Swyfte's dilemmas of personal versus professional codes." "The new Swords of Albion series, set in an alternate Elizabethan England, gets off to a smashing start. The historical detail sets a believable backdrop, and the main character, a spy, could pass for a fantastical James Bond. Chadbourn sets a fast pace, pitting his characters against supernatural threats with a bit of horror thrown in." "This well-paced spy thriller . . . promises more jolly adventures in the Swords of Albion series as it pits humanity against the Faerie. This is a place where the things that go bump in the night are best left alone and the important issues of the day echo today's headlines, making for an interesting alternative-reality read." "The Silver Skull has such an array of complex characters, deeply involved in their interesting times and guarding so many painful memories and secrets, there's something here for anyone who wants more than a bunch of cardboard figures going through the motions while the body count keeps rising."